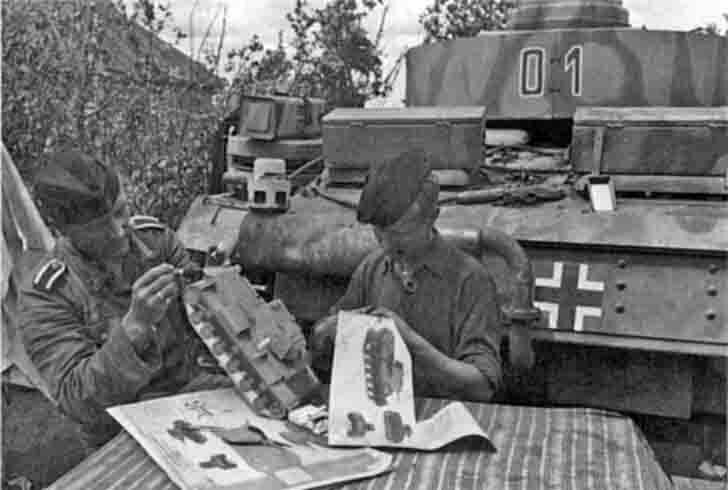 German tank crews glue paper model of the Soviet KV-1 heavy tank. On the table is waiting in the wings paper model of another Soviet heavy tank – the KV-2. At the beginning of the war the German industry was producing such visual aids – ‘Field identification of tanks. ” During assembly, soldiers memorize the characteristics and the silhouette of the combat vehicles of the enemy. The same practice was used by the British during the Battle of Britain – the German model of aircraft 1/72 scale were given to farmers who live on the coast of the English Channel and have a home phone.